Fun and excitment for kids of all ages, this Skagway tour places you in the "sled" with your own authentic Alaskan husky dog sled team. At the camp you will have an opportunity to mingle with our mushers, learn about the Iditarod and other famous sled dog races, and pet our adorable puppies. This is a family oriented tour that blends fun, education, and excitment. If you're a dog lover, this is the tour for you and your family. 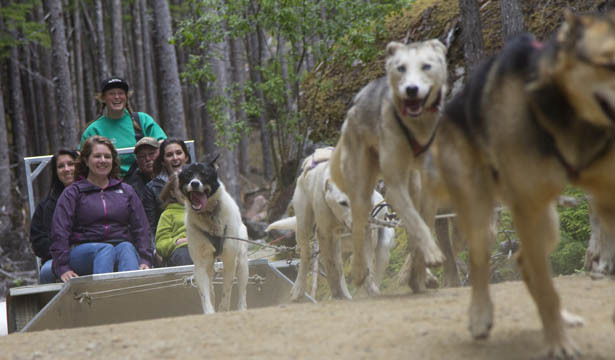 The sled used on this tour is a custom-made wheeled sled, that is pulled by a team of dogs along our rain-forest track. A Unimog ride is also included. This tour is suitable for anyone that can walk 100 yards and step up 12 inches. Camera and jacket recommended. Complimentary drink provided.